Last month, we gave the Cooler Master MH703 a go and had quite a good experience using it in our gaming sessions. In this article, we are going to take a look at the Cooler Master MH710, and look at the difference between these two models. 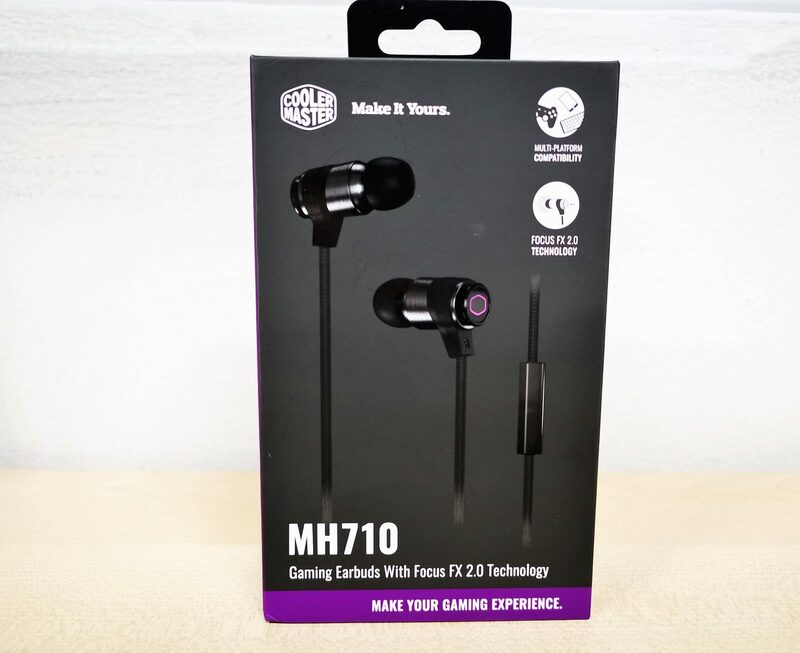 Similarly, the MH710 is also a set of earbuds that has been specially tuned to work well in games. The main difference of the MH710 as compared to the MH703 is that it features the “Focus FX 2.0” technology. What is Focus FX Technology? The Focus FX technology was first featured in the Cooler Master MH850 gaming headsets at CES 2018. Focus FX allows the audio product to isolate the mids and highs. With its Game Mode enabled (with a push of the button at the side of the earbud), you will be able to hear footsteps really well and give them an edge in FPS games. Alternatively, if you are just using the product for general entertainment consumption, you can simply switch it to Movie/Music Mode. After a year of further development on the technology, Cooler Master has “2.0-ed” the technology and brought this technology to their gaming earbuds. Will the MH710 sound better than the MH703? Does a higher model number really mean that it will perform better? Let’s find out more about the product. The MH710 looks a lot like the MH703. On the first look, it will even be easy to mistake the MH710 as the MH703. While most of the characteristics remains the same, the main difference comes from inside the earbuds. In order to integrate the unique Focus FX technology, Cooler Master increased the size earbuds’ enclosure. This makes the MH710 earbuds slightly longer than the MH703. Other than that, the MH710 also inherited all the good features of the MH703. It also comes with a nifty little portable carrying case and additional accessories. In the box, there are a Microphone/Audio splitter, a USB Type-C to 3.5mm audio converter, airplane audio jack converter, and also earbuds in various sizes. The MH710 also gives users the impression that it is a premium audio product because its wires are braided. This allows the earbuds to be more durable. Also, this design also prevents the wires to be easily entangled. Like the MH703, the MH710 also has an inline microphone. It makes it a lot easier for gamers to join a game chat just with a single audio product. Moreover, the housing unit for its inline microphone is also a button itself, allowing for media playback controls. To pause or play songs on the current playlist, they can press the button once. They can also double press to skip the song or triple press to go to the previous song. The Cooler Master MH710 comes with a pair of 10mm Neodymium audio drivers to make sure that it is loud enough and able to reach a wide spectrum of frequencies. These drivers are considered large for a set of earbuds, and therefore, we are expecting quite a bit from the MH710. With the earbuds set to Game Mode, we felt that the bass and lows were lacking. While this feature did help gamers to identify footsteps as they will be more aware of them, the less sensitivity to lower frequencies also meant that gunshots weren’t that impactful. Furthermore, this also made the whole audio profile less holistic. Together with the lack of the dynamic audio frequency ranges, sounds coming out from the earbuds seemed really flat and “airy”. On the other hand, with Movie/Music Mode switched on instead, it seems like the MH710 was able to showcase its true capabilities. The general audio profile sounded a lot better and it was able to distinctly express its strengths in all low, mid and high frequencies. However, do take note that audio preference is largely subjective, and what I may enjoy may not equate that it will be good for you. In my opinion, unless it is extremely critical for you to hear the footsteps in a game, you will be better off with the Movie/Music mode, which will give you a much more immersive experience in your games. The Cooler Master MH710 is a decent pair of earbuds that’s not just good for gaming, but also general use. It was able to perform much to our liking, as it was well rounded in all the different sound frequencies. However, we thought that the Focus FX 2.0 technology could have done better, as the activation of “Game Mode” is focused on the mids and highs, but somewhat excluded the lows, which affected the overall audio experience on the earbuds. Nonetheless, Movies/Music mode saves the earbuds from its potential lacklustre wholesomeness in Game Mode. Also, the Cooler Master MH710 is also designed to be very durable with braided wires, which sets the earbuds apart from competing products. We also liked the fact that Cooler Master also included different adapters and cables within the package to make sure that the earbuds will work with any kinds of device in the market. If you are looking for a pair of decent earphones to fulfil your gaming and entertainment needs on the go, do consider the MH710. Alternatively, we thought that the MH703 is also equally good, if you aren’t looking for any fancy footstep isolation technology for you earbuds.